1. Any manager, coach or player ejected from a game must sit the next game a second ejection will result in a three game suspension and the MBSA board hearing. 2. Division coordinator must be informed of all game protests within 24 hours after the completion of the game in protest. Both game managers must provide information pertaining to the protest within 48 hours. 4. Each game will be 6 innings OR a 2 hour time limit. You cannot start a new inning after 1 hour and 45 minutes has elapsed. However you may complete an inning if it has already started and is now beyond the time limit. b. A maximum of 6 runs is allowed per ½ inning, regardless of the number of outs. c. When 6 runs are scored or 3 outs are made the half inning is over. 6 runs or 3 outs whichever occurs first. 5. You can start a game with 8 players and must finish a game with 8 players. If you start a game with 8 players and 1 player leaves you forfeit the game. 6. All players must hit in the lineup with free substitutions in the field. 7. A player injured or leaving the game will not be recorded as an out in the lineup. 8. A player arriving after the game starts will be inserted at the bottom of the order. 9. Batters on the bench including on deck batters are NOT ALLOWED to take practice swings. The manager and coaches are required to make sure this doesn’t occur. Managers and/or coaches can be ejected for allowing practice swings to occur. 10. Runners may continue to run the bases until the ball is in control of the pitcher and within the pitcher area (circle). Use your discretion; if the runner just passed a base and the ball is in control of the pitcher and pitcher is within the pitching area then have the runner return to the base he just passed. Runners do not advance on overthrows. Make sure your base coaches are aware of this rule. 11. Each team fields 10 players, there will be 4 outfielders (spread evenly) no less than 20’ from the infield. There cannot be more than 10 players on the field at any time. No player is allowed right behind second base. 12. Every player must play at least 2 consecutive innings in the field and cannot sit out more than one inning in a row. Every Player must play at least 4 innings in the field (6 inning game). 13. No player may play more than 2 innings at one position with the exception of 1 st base. (Managers should position a player at 1 st base that is proficient at catching the ball in order to avoid potential injury). Every player shall play at least one inning in the infield and at least one inning in the outfield. d. Pitchers are encouraged to wear heart guards although it is not required. b. If the pitcher walks 4 batters in one inning prior to the completion of the inning the pitcher must be removed. c. A manager or coach may make three trips to any one pitcher in any one inning. On the fourth trip that pitcher must be replaced. d. The pitcher can take any other position but may not pitch again in that game. 18. A batter will be called out on a third strike dropped by the catcher and no play to first may result. 20. Catchers can use their own glove instead of catcher’s glove. 21. With two outs a Manager is allowed to put a courtesy runner in for the catcher. The runner must be the last batted out. 22. Sliding headfirst is not allowed. If a runner slides headfirst he will be called out. The runner must slide or avoid at all times or the runner will be called out. 23. No barreling by a runner or fielder is allowed. A warning will be given the first time. 2 occurrences by the same player during the same game will result in the player being ejected for the remainder of the game. When the runner is the offender an automatic out will result. When the fielder is the offender the runner is safe. 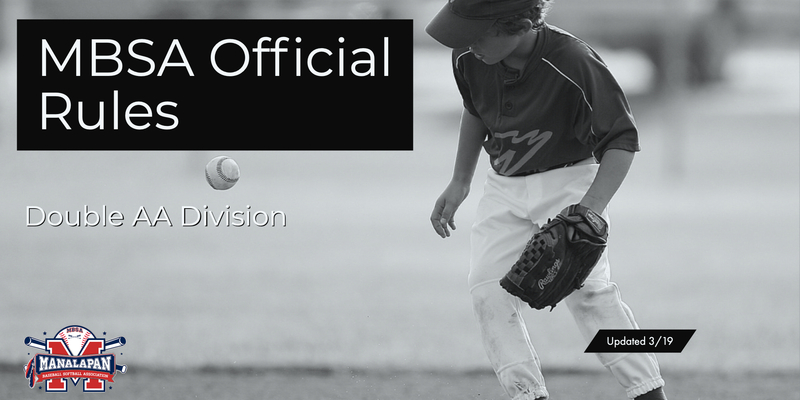 Make sure your parents and players are fully aware of this rule. 24. No Leads or base stealing is allowed. 25. Players cannot advance to the next base on an overthrow. 26. Batters and base runners MUST wear helmets. 28. There is no bat throwing at any time. If a player throws a bat, there must be a warning given. After the warning, please notify the parent. 29. Defensive coaches are not allowed on the field and should remain in the dugout. 30. The team on offense should have a 1st and 3rd base coach. The manager may appoint a third coach to manage the bench. 31. No shorts are allowed during a game, only uniform pants are allowed. 32. Home team shall always use the first base dugout. 33. The first game home team shall set up the field and the last game home team shall put away all bases and umpire equipment in the shed. 34. Only approved little league bats with a USA Baseball logo and wood bats may be used (max barrel size 2 5/8). Any bats not meeting this specification must be removed from play immediately. 35. Players must wear an athletic supporter/cup and cleats. Heart guards and safety glasses are recommended but optional. 36. Ask your parents if they want their child to wear a caged helmet while batting prior to the start of the season. If a caged helmet is worn it is replaced by a standard helmet if the batter reaches base. 37. Let parents know they need to get to the field 15-20 minutes prior to game time. All coaches and managers should be on time as well. As they get older, warm up period becomes more and more important. 38. Fields must be maintained (raked, policed etc.) and will have baselines done each week, as well as coach boxes. There will be a schedule prepared for the season. Each manager will be responsible to submit their parent who will be doing the field maintenance on the designated week. Parent must sign schedule book (in the shed) upon completion. Failure to perform scheduled volunteer work will result in forfeit of work bond. 39. The 1st game’s home team is responsible for getting the equipment (bases, home plate and mound) from the shed. The home team from the last game is responsible for returning the equipment back to the shed.